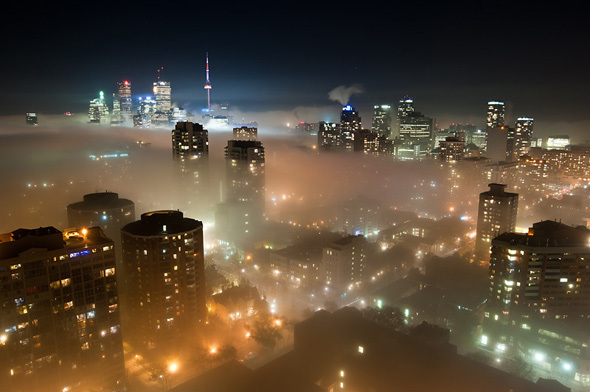 It was a very rare night last night: Toronto was covered in a fog like I haven't seen in years, the type where visibility is reduced to (literally) about 15 feet, where you can inhale the water particles while wondering "where did the city go?!".. ..moments of clarity as the skyscrapers block it out would result in one street being a strange misty glow while the one right next to it crisp and clear. Destined to be special. It was on such a magical night that I ventured out to see one of the greatest DJ/producer/songwriter talent combinations on this planet: DJ Shadow and his "Shadowsphere" tour. Getting in to the venue revealed part of the Shadowsphere: big screen at the back of the stage and a larger-than-man-sized sphere in the middle with (iPad controlled?) projectors off to either side. The name of the opening act eludes me, was two pretty fine ladies that MC'd and sang over a bunch of dope DJ Nu-Mark (J5) beats and some old school thrown in for flavour (anything from Tribe pretty much gets the respect of the original hip hop massive :)). It was a healthy contrast to what was coming up and fit pretty well.. Throughout the set that sphere was used to great effect: virtual chainsaws cutting through it, then it's the Death Star, then the ever-changing iris then it's a cue ball going 'round the pool table, inside shot, planet earth, etc etc. Intensely visual. Sometimes DJ Shadow would rotate it to reveal himself and all his kit inside the thing while the visuals were on the periphery. Musically it was, of course, almost impossible to define. Known for his immense record collection you're always in for a treat from this digger. His skills were impeccable, it could have been a recording if we didn't see what he was doing with our own eyes. The tunes varied from old classics to new, undefined, unnamed pieces that spanned the range from samples of scratchy sounds from decades passed through to a DnB flavoured Six Days, tastes of dub, hip hop and even a dip in to a contemporary techno treatment resulted in a special audio/visual treat..
At times it was trip hop epitomized and really great to be a part of. If he's making a stop near you (NYC next!) then catch it if you're in to the artist/genre, he's top of his game! ..if you don't know anything about DJ Shadow: it's a hard introduction to make given so many vectors of approach, give "Entroducing" a try -- listen to the whole album to get a taste. Warning: If you haven't heard stuff like it before you might become addicted! It almost never gets boring! Sphere thing looked good in the dark. Thought the music was trash though - urgh! Crystal wrote: Sphere thing looked good in the dark. Thought the music was trash though - urgh! Thing is with DJ Shadow or anyone that creates audio landscapes: if you don't like something they're playing it'll be totally different in 2-4 minutes anyway. This is why I find it extremely listenable; often if you're listening to an artist and you don't like it -- you're boned because the rest is largely the same. Listening to an hour of DJ Shadow will take you in to so many places that it's next to impossible not to like one of them. Of course if you don't like beats that fall in to "Hip Hop" category then there's probably only about ~25% of his stuff that you'll like which means he and/or a large chunk of music just isn't to your taste. Yeah, wasn't talking about musical talent, just the visuals aspect. I'm a decent fan of hip hop, I like my occasional Sage Francis and think turntablists are super cool, so I'll probably give DJ Shadow a good listening to. Try reaching out to Cut Chemist as well, you will find goodness within!! I will promise to give the guy a chance and listen more but to me anything hip-hop is just awful. Bleh. Meh. Awful. Well, it's not actually awful but clearly you don't/won't like it -- don't suffer then and move along, there's plenty of different synthesized beats that'll cater to your taste! Think I found a new DJ to get into. Certainly beats half the stuff posted in the "New Music Thread." It's a shame he's coming TOMORROW to NYC and I didn't have more notice! Does look like he's hitting Maryland right before that though, I may have to venture down, just to check him out! Last edited by Vengeance on Thu Mar 08, 2012 12:25 pm, edited 1 time in total. i think u should fly down to San Antonio may 24 and go to the Rammstein concert with me.